Juxtaposing the lighter evenings making an appearance in the UK at LAST, we’ve got a darker selection of books for April’s Book Club. From a damning polemic of race relations in the UK, to a disturbing and sinister tale of every parent’s worst nightmare, it may not be all cheery but there’s some essential reading in here that will get you thinking. The liberals of this country, Reni argues with passion and anger, like to pat themselves on the back about the lack of racism in the UK. Look at America, look over there… there’s a country that was founded on slavery and whose racism has been widely documented over the decades. Here, in the UK, there’s been less vehement criticism for the way people of colour are represented in the media and indeed treated on the streets of London. Because WE don’t have a race problem. Reni’s book is an enlightening look into what it means to be the ‘other’ in this country, the history of black people and how structural racism is endemic in our society. 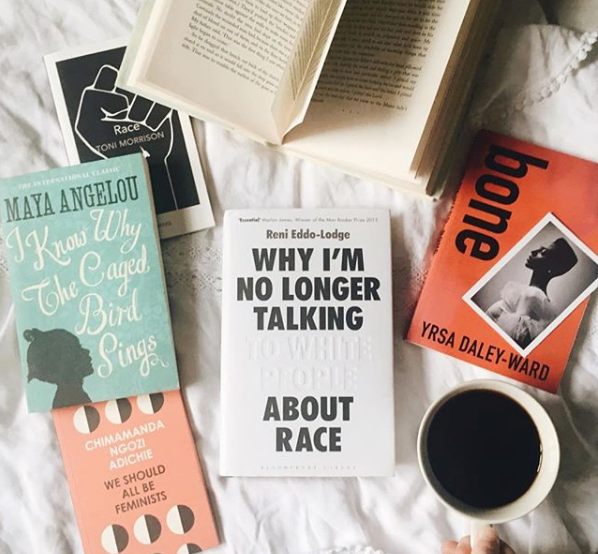 She firmly asserts that we shouldn’t be focusing on the extreme cases of racism, but the subtle dominance of white discourse that pervades our everyday lives. This is not, nor should it be, a comfortable read for anyone, as it shows with real clarity and verve that it’s not helpful to be liberal and supposedly ‘colour blind’. Instead, she suggests recognising whiteness and what that means will at least begin a more helpful conversation. 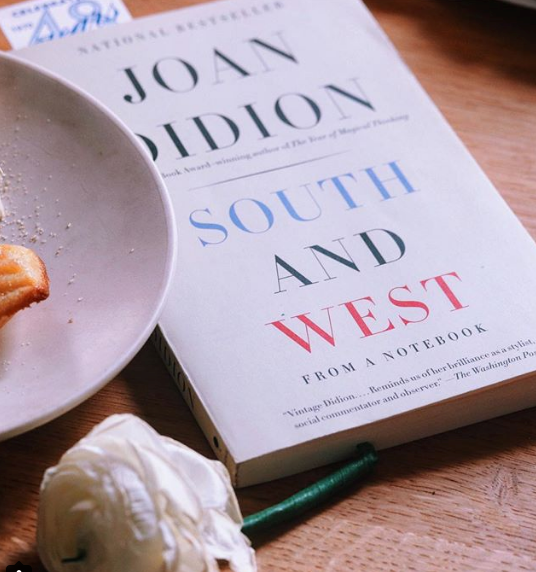 A short and succinct read on Joan Didion’s road trip to the South. She wrote about why she wanted to go: “I had a theory that if I could understand the South, I would understand something about California, because a lot of the California settlers came from the Border South.” It is a counterintuitive theory, for the South and the West represent the poles of American experience—the South drowning in its past, the West looking ahead to distant frontiers in a spirit of earnest, eternal optimism. “The future always looks good in the golden land,” Didion wrote in “Some Dreamers of the Golden Dream,” “because no one remembers the past. In the South no one can forget it.” What comes from her ‘notes’ is a distinct sense of a land so vastly different from the west, one where the heat is suffocating, the values and feelings at odds with so called real America in California. A book all the more pertinent now, when Trump has been elected, and that North/South, Rich/Poor divide seems to have worsened. This may be 1970 but what, if anything, has really changed? A family in Paris hire a nanny with fatal consequences. Don’t worry, this really isn’t a spoiler – the first line, “The baby is dead. It only took a few seconds” sets the tone of this unsettling thriller. Reminiscent of We Need to Talk about Kevin, this is a book that voices every mother’s worst fears, voicing the anxieties of all women hoping to ‘have it all’. ‘The nanny’ of course, has always held that odd role in the family, as guardian and protector of children, part of the wallpaper almost, privy to family secrets and a mother’s guilt. Leila Slimani subtly paints a uneasy portrait of a white nanny in an industry of immigrants, marginalized and cast as an outsider, whilst the mother in this story is in fact of Moroccan descent: ‘I felt it very important to say that sometimes the boss is an immigrant, and that sometimes the poor are white,” she says. “This made it violent as a social relationship.” Lullaby is a gripping read – one you won’t want to put down. Lena Dunham loves Jenny Zhang, and you will too. Her collection of short stories link together the stories of immigrants in New York. With a mixture of crude humour and vivid portraits of crumbling houses crawling with vermin and three in a bed as the norm, she successfully shows us the hardships and lack of dignity in the 1st generation immigrant’s struggle to give a better life to their children. There are loose threads that link all these short stories and the families within them, all told from the viewpoint of adolescent girls, the most prominent of which is Christina. Again, as we see America become more polarized than ever, it’s helpful to read a book that vocalizes the immigrant experience with ‘unexpected and mischievous’ prose. You’ll laugh, you may even be a little bit shocked and you’ll definitely enjoy it. Eminently readable.